I know so hard to choose. 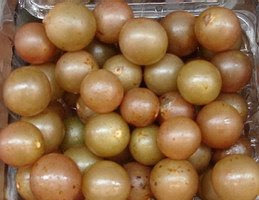 In addition to being the month of my birthday August is the month for muscadine season. When I was little my grandparents friends had vines and we'd pick ice cream buckets full (the plastic ones). And I would make myself sick eating so many. Ahh those were the days, now I have to pay for them by the puny carton. One day I will grow my beloved native American grape and have enough to make jam. Until then I will ration some of my grocery budget on this Southern delicacy in August & September. Yummmmm, muscadine jelly! We used to make that with the muscadines that we picked. I love 'em, wish I could get ahold of some here.